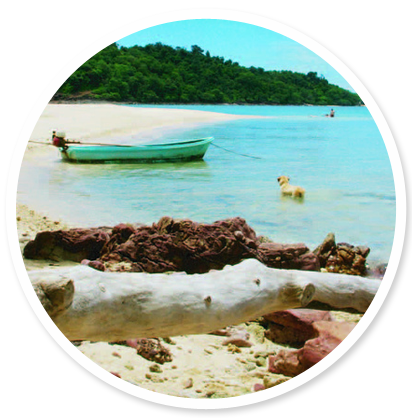 Good Time Resort Koh Mak | Thailand Resort. Enjoy one of the island’s best locations, with stunning view from the elegant Thai styled villas, gazing down on two beaches. Our charming resort nestles in a lush tropical garden on a low ridge between Ao Kao beach and Ao Phra beach, two of the loveliest on this idyllic island. Here you will find soft white sands, calm turquoise waters and the convenience of restaurants, shops and tourist services, without the crowds. If you’re looking for peace and quiet, then this islands is perfect and our Koh Mak Resort provides you with a comfortable, family-friendly stay. Come stay with us, we have a variety of well appointed rooms and villas for families or couples, a lovely swimming pool, delicious food, library, wifi, kids playground and friendly staff. Our favourite summer packages, hand-picked for you. Good Time Resort offers a Green Discount. located between Koh Chang and Koh Kood. The Good Time Resort is a family run independent hotel. enjoy sharing them with you. We guarantee the lowest price for our resort, find a cheaper rate elsewhere and we will match it. The Good Times Resort on Koh Mak enjoys one of the island’s best locations, with stunning view from the elegant Thai styled villas, gazing down on two beaches. Copyright © Good Time Resort Koh Mak 2019. All rights reserved.